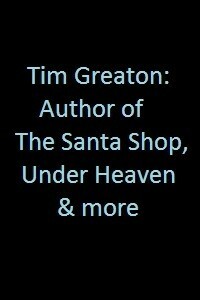 Going into this author interview, I knew only a few things about Tim Greaton: he's a dedicated family man, a writer who enjoys social networking and a man who leads a busy life. He is supportive, especially of indie authors, and is always respectful to others. I must admit to having read, enjoyed and shared my thoughts about his book titled, The Santa Shop. It's a book I would definitely recommend everyone to read, especially those who may be feeling an overwhelming sense of depression or have been having thoughts of committing suicide. On a happier note, it certainly was my pleasure to catch up with Tim - to get this interview underway - because he is so busy. There are a few questions Tim has taken the liberty to answer for me and I would like to share his responses with you. Tim: My childhood wasn't what anyone would call normal nor was it easy to endure. Because running away didn’t seem possible, I used to escape mentally into books. No matter how bad things were, by delving into a novel I was able to enjoy - at least for a short time - life didn’t seem so miserable. Now, writing is a way to give something back to other readers who might be enduring their own challenges. If I can provide even a few minutes escape from a difficult circumstance, then I figure I have succeeded. Tim: I wrote my first book when I was about seven-years-old. I don’t remember much about it, except that it involved astronauts. My mother gushed about what a wonderful story it was and how I was such a talented writer. I think that was the day I knew I had to become a writer. Budden: From its inception, how long did it take you to write and publish your first book? Tim: I don’t remember a lot about my first adult attempt at writing a novel, but it was a fantasy story along the lines of Tolkien or Terry Brooks. The main two characters were barbarians from a primitive culture. Unfortunately, or maybe fortunately, that story disappeared long before I got around to finishing it. I had a creative writing college professor who was enamored of my writing. She read my work to the entire class about halfway through one semester and told my classmates that they should aspire to someday write as well. Then she encouraged me to begin submitting to magazines and maybe even to begin writing a novel. Well, my first nationally published stories appeared just a few months later, so I began to write Ancestor, a series of two horror novels. I worked three hours each morning for one entire year to finish the first drafts, then I took another six months to edit them. Unfortunately, the few agents and publishers that even bothered to get back to me said they were too long. After about fifty rejection letters, those manuscripts went into storage. That was over twenty years ago. Earlier this year - 2011 - my brother’s publishing company released those two books in uncorrected ARC (advance release copy) format. We intend to use the feedback from readers to determine how much rewriting should be done before they are released in hardback and paperback sometime in 2012. Budden: Is writing mostly rewarding or filled with varying levels of frustration? Tim: I love to write. The process of creating a new story with new characters is truly engrossing and really fires up the creative parts of my brain. So, in that way, writing has always been fulfilling for me. So, too, is the feedback I get from readers. I received one email, for instance, from an Australian woman, who also happens to be a children’s book writer. She wanted to let me know how much she appreciates the way I get into the heads of my characters. She said I have become one of her favorite authors to read. Writing does have its frustrations, though, which include haggling with editors and having to deal with the business side of writing. Most of my frustration stems from the limited amount of time in any given day. This new age of network marketing means that I receive literally dozens of requests each week for interviews, guest blogs, physical appearances, or any number of other publicity needs and wants. I couldn’t possibly keep up with all the requests even if I didn’t also have books to write. So, I just do my best and hope people understand; I don’t yet have a staff of twelve to help me keep up with everything. Budden: Are you currently writing another book? If so, we'd love to hear more about it. Tim: I always have at least a half-dozen book projects going at any given time. I have both a paranormal romance and a children’s book based on my Zachary Pill fantasy series in the early stages. I also have a couple of books going through editing reviews at the moment, and my second book in The Santa Conspiracy is working its way through the final stages of release. Titled The Red Gloves, it’s the story of a police detective in Portland, Maine. She has to endure the collapse of her marriage and problems with her son, while also pursuing a mysterious criminal who no one else in her department even believes exists. It’s a very emotional story but the story should leave readers shedding tears of happiness by the end. Budden: I know you have quite a few novels already on the market. Which book is your favorite and why? I also felt that the book allowed me to work through some of my own childhood shadows. Though I never endured anything as horrible as what Nate or Jesse - the two boys in my story - go through, I did feel relieved after writing about them. It was almost as though I was able to share personal emotional secrets with my readers. Tim: Three authors come immediately to mind. I love Piers Anthony because his Xanth and other fantasy and science-fiction novels were wonderful escape fictions for me as a teen. I really appreciate Orson Scott Card because his Ender’s Game novel is quite possibly one of the most powerful character novels ever written. Finally, Stephen King is at the top of my list, not just because he’s a Maine neighbor but because he has had such a long and successful career and is a truly talented storyteller. Though I don’t like all of his novels, I really do love some of them: The Stand, Cell, and Duma Key are all pretty great. Budden: What is your ultimate dream, in terms of being an author? Tim: What a wonderful and terrifying question. You’re the first interviewer to ever ask me that, Norma. Of course, like every other author, I’d love to be at the top of all the bestseller lists. More importantly, it would be wonderful to be recognized as an author who creates books that are not just entertaining but are also filled with hope. Yeah, that would be the ultimate. Budden: What is one of your favorite quotes? It can be from a book you wrote or something you heard throughout your life. If you did not write it, please cite the source, if possible. Tim: The Gettysburg Address is, of course, a wonderful speech with immeasurably important themes, but my main reason for enjoying it is that it was the only long passage I ever committed to memory and was able to use against my children. They’d get noisy in the car, I’d start quoting the address. They’d ask what made me think I was so smart, I’d start quoting the address. They’d ask something about their homework which I couldn’t answer, I’d start quoting the address. You’ll also note that I only mention “starting to quote” the address. That’s because after many years of having my children shut me up, I’ve forgotten all but Lincoln’s first paragraph or two. Budden (smiles, trying not to laugh): Tell us a little about your life. What does an average day look like? Tim: During the week, when I’m not on tour or making appearances, I usually wake at around seven, workout for somewhere between one and two hours (weights mostly.) By nine, I settle into my home office and start answering emails and overnight requests. By ten o’clock I begin writing, usually until about five or six. My evenings are split between family and marketing requests. I don’t usually get off the computer until about eleven in the evening. I used to work like that seven days a week, but nowadays my weekends are more often occupied with landscaping and building projects. I still write and handle emails on weekend evenings, however. All this work may sound a little overwhelming until you understand that I love what I do and I live and work on seven acres in Maine. My sixty-foot porch overlooks a brook and a pond full of ducks. I can take a break anytime I like and wander out onto my porch or even down onto my bridge where I feed the birds. Not such a bad life. Budden: Sounds like the kind of life I would enjoy living when I, ultimately, leave Arctic Canada to enjoy warmer temperatures. I only have one more question, I promise: what are three of your favorite hobbies? Tim: Reading is, of course, at the top of the list. Second, honestly, is writing. Third is probably landscaping but that’s more of a need to do something physical after a week in front of a computer than because it’s a hobby. I’d happily spend the same weekend time hiking or rock climbing if I didn’t have a large property to maintain. In closing, I must say thanks again for allowing me to be with you today, Norma. I have to say this was a lot of fun. I hope we can do it again, maybe on my forum next time. You can catch up with Tim Greaton at his blog, The Perfect World. However, he also features "the most talented authors, artists and business people living and working in our world today" at Tim Greaton's Forum. Budden's closing thoughts: Well, it appears that one of Tim's most undesirable places to be is in front of the camera; I have yet to find a photo to feature on this interview page. On another note, I must admit to admiring Tim as a person and author even more than I had before. It's not everyone who can take nightmares from the past, push past them and become successful in a career he enjoys, while holding onto a family he treasures. Yes, Tim Greaton has become a success in many ways and I pray life continues to bring him health, peace and happiness. One more thing: we did catch up on Tim Greaton's blog. You can read all about our interview here. Below, you will see covers for the books Tim Greaton has published so far. Click on either cover to be taken to a book's page on Amazon.